Ann Stevens cleans up the facial wounds inflicted upon Dragon by OpenFace and tries to pluck up the courage to talk to him about something private. A call comes through on the police frequency and Dragon is taken by Julian Graham in search of Octopus who has been sighted in the underground. As the officers are about to leave, Peter Klaptin is introduced to him by his agent, Guy Guswell. Dragon agrees to a meeting in return for some concert tickets for Rapture but he really must leave. This reminds Peter that he needs to be elsewhere, something he has said enough to make his bodyguard, Chris Robinson, lament hearing it yet again. Bonnie Harris returns to her apartment to find the Fiend waiting for her, offering the woman the chance to become his new host. Bonnie is promised enough power to extract revenge upon Dragon and she asks to hear more about this opportunity. The Fiend opts not to talk but rather merges with the woman to become his most powerful incarnation yet. Dragon arrives at an opening to the underground and suggests to Julian to remain behind as he is clearly too jumpy to be going into such a potentially dangerous location. He is instead joined by the vigilante Star and as the pair start to squabble they fall through the ground and are caught in a huge web. 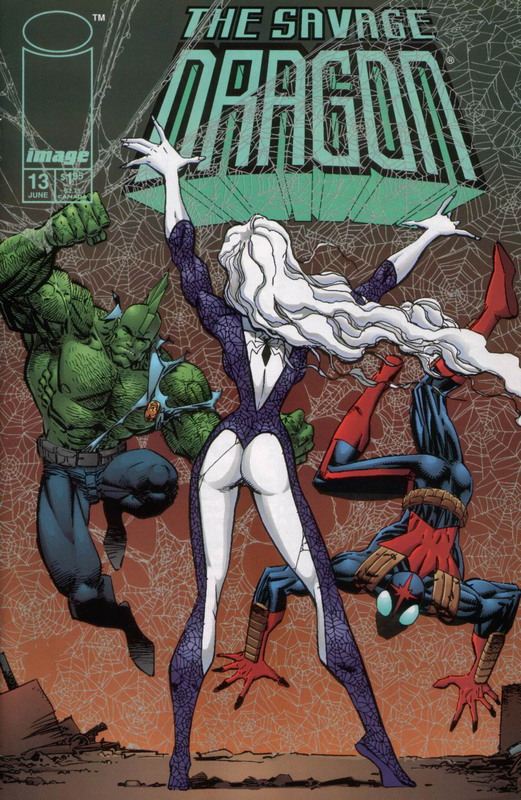 Star gets nervous and when a spider-themed super-freak named Widow reveals herself, he gets ready to fire his throwing stars at her. Dragon orders that he lowers his weapons but before they can question Widow she has already fled the scene. As the two heroes make their way into the main underground chamber, a tribe of freaks emerge and surround them. Their leader is Rock and he demands that they leave their home immediately. Dragon assures him that they mean no harm and are simply searching for Octopus. Radical is enraged about this apparent infringement on their home but Rock calms him down. He knows that they do not own this region and are technically trespassers themselves and so grants permission to perform a search. The hunt turns up nothing and Dragon heads back up towards the surface with Star who is frustrated that they did not get into a fight. The pair is unaware that although Octopus may not be present, the recently resurrected CyberFace is being cared for by two young super-freaks, Beast Boy and Feezle. They bring the recovering villain some food in the hope that they can rebuild his strength. Dragon reaches the surface to rejoin Julian and realises that Star has already left the scene. A call comes through about Mighty Man getting involved in a fight near Hillman Hospital and the police officers race on over to the scene. The Wildcats and Freak Force have gotten into a fight with one another and when Dragon arrives he talks with Grifter. He points out that Freak Force are also heroes which causes the Wildcats to be told to stand down. Captain Stewart arrives to take control of the scene and is convinced by Dragon not to press any charges against either team of heroes as Lord Emp has offered to pay for any damages. Mighty Man then requests that Dragon go with him somewhere private for a conversation. Once they are inside, Mighty Man reveals his true identity to Dragon as Ann Stevens. Ann explains how she gained the abilities of Mighty Man from the dying Robert Berman but kept this revelation a secret for a long time. Dragon asks about when SuperPatriot was possessed and attacked him and she tackled him as a human when she could have simply became Mighty Man. He is impressed with her bravery but their conversation is ended when Rapture comes to take away her boyfriend. Lord Emp pays for a vacation for all of the Wildcats and Freak Force and takes them away to a tropical vacation as a means of apologising for their recent fight. As they lay together on the beach, Rapture talks about how jealous she got just by Dragon talking to Ann. She is eager for them to stop taking things slowly and Dragon finally relents, prompting Rapture to literally jump on top of him! NOTE: The “Savage Dragon Vol. 4: Possessed” trade paperback collection combines this issue with WildC.A.T.s #14 and inserts a new page of Dragon & Star’s side of the story.